Many streams in the Ouachita National Forest are too brushy to paddle, but here’s one that has enough drainage area and bedrock to overcome the tendency to be brush filled: West Gaffords Creek. 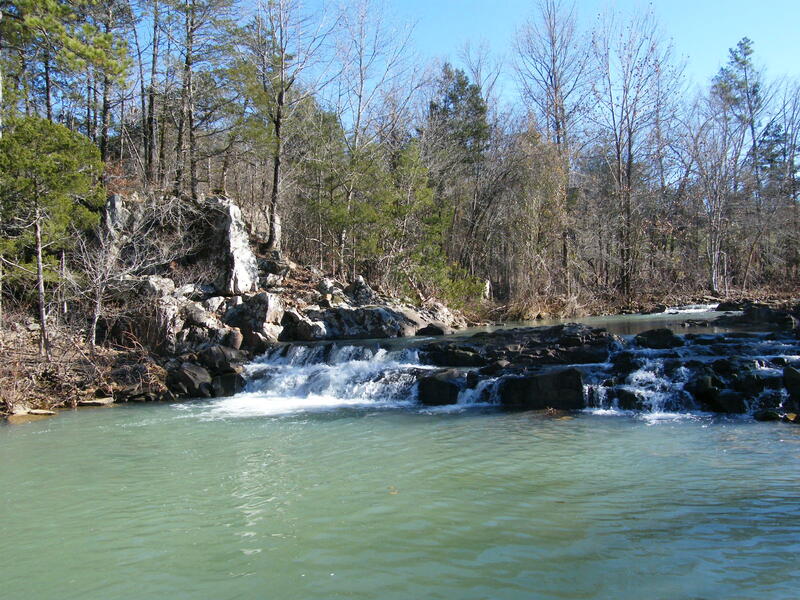 This Class II-II+ stream is located near Bluffton, on Highway 28 in southwestern Yell County. It begins in the Forest and flows north to Highway 28 and on into the Fourche La Fave River. The last two miles of the creek flow through private property, so be respectful. One landowner lives on the edge of the creek and has granted permission to float through his property. The general location of the creek is southwest of Danville, passing under Highway 28 just west of Bluffton. The put-in and take-out are shown on the map below. Take paved Bluff Road south off Highway 28 just west of Bluffton; you will pass a cemetery as soon as you get on Bluff Road. The road turns to dirt as you continue south; watch out for dogs sleeping at the edge of the road in front of houses. Continue until you pass a horse ranch and descend a hill that gives you a view of East Gaffords Creek and a bluff to the west. Pass a couple more houses and stay to the right where the road becomes paved; this is FS 970. 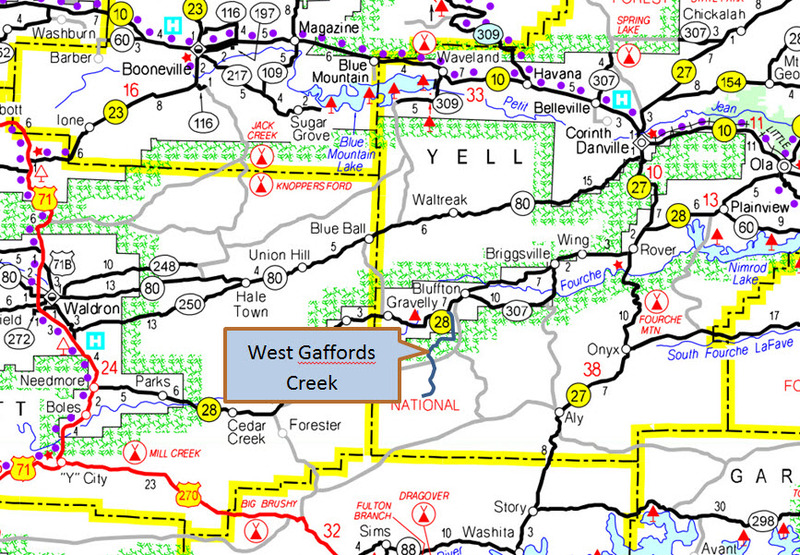 Drive over the first high bridge which is over East Gaffords Creek (gawk at the rocky rapid upstream of the bridge) and continue to just short of the second high bridge (that bridge will be the 3.0 mile point as you paddle down West Gaffords Creek) and turn left on paved FS Road 776A. Continue to the high bridge you come to on FS 776A; the put-in is on the upstream side of the bridge, on river right. You can drive to the water’s edge by following a vague trail that heads off of a road that runs east from the pavement just short of the bridge. Previously the put-in was described as being another 0.75 miles upstream at a gravel bar. DO NOT PUT IN THERE ANY MORE! A flood washed many trees into the creek just below the previous put-in, making it not worth the effort or risk. The creek has an average gradient of 30 feet per mile. Small bedrock falls similar to those found in the Spring River appear frequently. Fast chutes with occasional boulder gardens are typical. There are several pools, none of which are very long, and some nice scenery. Total length of paddling is 6.4 miles. You can paddle the first 2.2 miles and take out at the bridge on FS 970; the best access there is just downstream of the bridge. Follow a vague road north off FS 970 just east of the bridge to get down to another clearing used as a hunting camp. 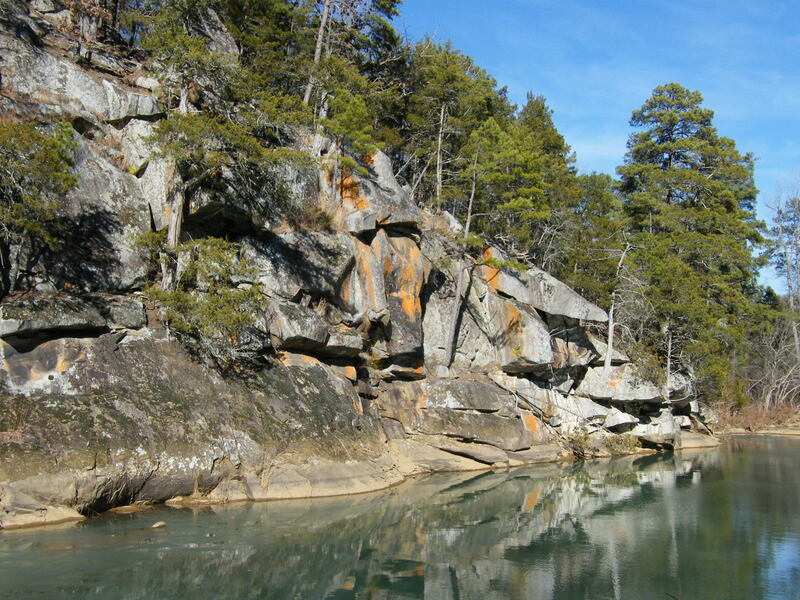 The last 4.2 miles of the creek contain boulder gardens, weaving chutes with boulders, small ledges, and a two-step fall that is about six feet in total height. Run the fall on river right, about 10 feet out from the bank; there is a long recovery pool below the fall. You can portage the fall fairly easily on the left bank. The creek joins East Gaffords Creek and turns south; you will see a house on top of the bluff at the confluence. That house belongs to the landowner who has granted permission to paddle through. All the chutes in the next quarter mile are open. The last 2.0 miles are along or across large gravel bars; look for the easiest route. Take-out of the creek on the northeast corner of the bridge (downstream of the bridge on river right) using a dirt road on the highway right-of-way. Below is a photo of the falls and a photo of a pool/bluff from a set posted in the order you will encounter the subjects as you paddle the creek; the set is on Flickr at http://www.flickr.com/photos/17863908@N03/sets/72157640222555864/. TREES FALL CONSTANTLY IN THE FOREST FOR MANY REASONS. ALWAYS BE CAUTIOUS AND STOP TO LOOK AHEAD BEFORE PROCEEDING WHEN YOUR VIEW OF A RAPID IS BLOCKED. A rec kayak with a confident pilot should be able to negotiate this creek. UPDATE OF MAY 12, 2015: The creek level on this day was surprisingly low given how much rain had fallen and how much water was running in lots of small creeks that cross highway 60 on the drive to Bluffton from Little Rock. The gage showed 3.75 inches of rain over four days, then no rain the next day, and we paddled on the day after that. The gage is located just five miles due north of the watershed of the creek. That doesn’t guarantee that the same amount of rain fell on the area that feeds the creek, in fact, the radar showed that a lot of the rain missed the small drainage area, leaving it like the hole in a doughnut. I would call the water level low, but floatable, on the day of our outing. Running the falls turned out to be more of a slide than a vertical drop if you stayed about 10 feet from the right bank. The last two miles had a few nice whitewater chutes and some huge, migrating gravel bars like you might see on the lower Buffalo River. This section would be an excellent place for a field trip for those studying the geomorphology of a meandering, alluvial stream. At one spot the creek is in the process of cutting off a bend by shooting straight across an isthmus about 30 feet wide. The entire run was very demanding of your paddling skills at the water level we had due to the GREAT number of rocks that had to be avoided just under the surface. A lot of them were sharp, but I didn’t see any significant damage to my boat. At the water level we paddled, I would rate the creek a Class II++ and not suitable for rec boats because of all the rock dodging that was necessary. GAGE: Use the precipitation data shown for the Fourche La Fave River near Gravelly; the gage is online at http://waterdata.usgs.gov/ar/nwis/uv?site_no=07261500 During the rainy season I would guess that a 2″ rain would be enough to get the creek to a runnable stage the following day; THIS NEEDS TO BE VERIFIED; USE CAUTION!! !